The main focus of this latest update is compatibility with WordPress 4.6, the latest update from WordPress. 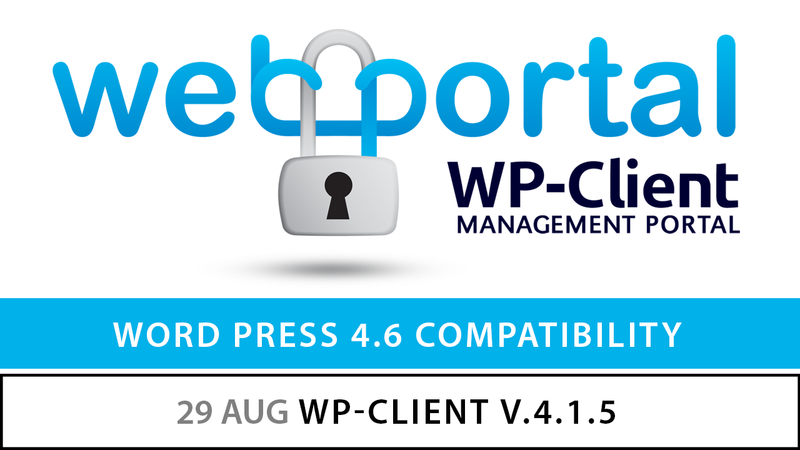 As of v.4.1.5, WP-Client is fully compatible with the latest WordPress 4.6 update. The specific changes that were needed for compatibility were related to email notification sending, as WordPress 4.6 includes some changes to the default email sending methods. Another new addition for WordPress 4.6 is the ability for users to login using either their username or email address, and WP-Client v.4.1.5 includes some fixes related to that change as well. Some smaller changes were also included in this WP-Client update for compatibility sake, related to backend CSS and menus. Another useful addition in this update is related paid registration. As of WP-Client v.4.1.5, we have added a new payment gateway option called “Invoice Me”. Invoice Me allows your clients to choose to defer payment when registering, and you will be notified via email when this payment option is selected, so you can generate the necessary invoice to send to the client. This feature was added at the request of a WP-Client customer, and we felt it could be very useful to others as well, for situations where you want to bill clients manually, or you would like them to be able to register without needing to pay right away. If this would fit your needs, the “Invoice Me” payment gateway can be setup from your WP-Client–>Settings–>Payment Gateway settings menu. This release also includes some bug fixes related to loading on various backend pages, using the Nuclear Option for deleting plugin files, a potential 404 error related to Portal Page links, as well as some small improvements related to AJAX loading in the frontend. A few other minor bugs have also been addressed, in addition to the normal streamlining and text updates.